♦ Sugar Loaf Civil War Earthworks – by Chris E. Fonvielle Jr.
After General Alfred H. Terry’s forces captured Fort Fisher in Jan 1865, he quickly turned upriver to strike Wilmington. They reconnoitered and probed the Sugar Loaf lines for a weak spot. On January 19, 1865, the Federals attacked with two brigades of troops, including Colonel John W. Ames’ regiments of U.S. Colored Troops. Unable to break through, they launched an even bigger assault on February 11. U.S. Colored Troops played a major role in what became known as the battle of Sugar Loaf, although the Confederate defenses again proved to be too strong to overrun. .. Read more .. 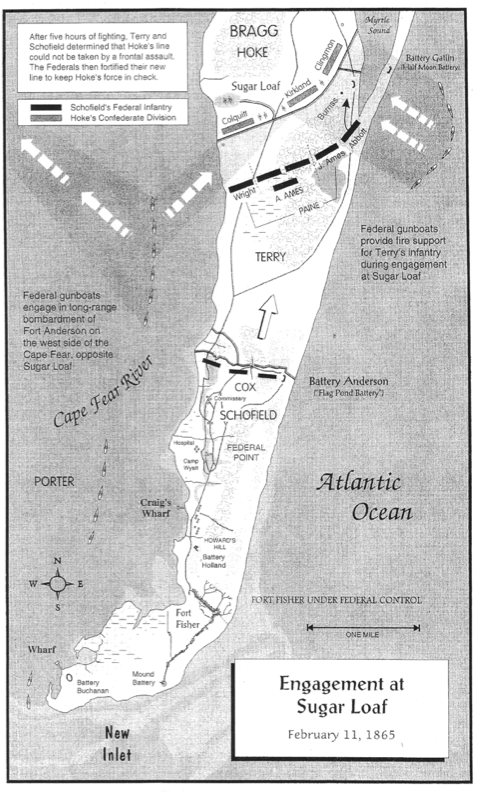 Subsequent to the fall of Fort Fisher on January 15, 1865, Northern forces began a cautious advance on the city of Wilmington from both sides of the Cape Fear River. After the evacuation of Fort Anderson on the west side of the river on February 19, Major General Robert F. Hoke had to abandon his defensive position across the river from that fort, at Sugar Loaf. Without any strong fortifications to fall back on, Hoke knew that making a stand between the enemy and Wilmington would be difficult. … Read more ..
♦ What a Cruel Thing is War” The final Civil War Sesquicentennial symposium, co hosted by the North Carolina Department of Cultural Resources and the University of North Carolina-Wilmington, will be held in the Lower Cape Fear, February 27-28, 2015.